Updated 10/10/2018: Another video from this same interview has been added. It is below the first. The second video has the cast delving into all things American and complaining about our food and spelling. 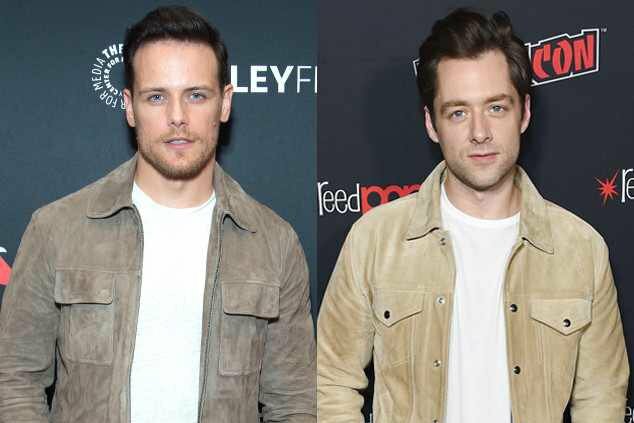 Original post: Sam Heughan, Caitriona Balfe, Sophie Skelton, and Richard Rankin take over interviewer duties and ask themselves and each other some questions about season four for E! while at New York Comic Con. Favorite Claire and Jamie moment, double dates, and Roger and Jamie hanging out are some of the topics breached in this brief interview. This entry was posted in Caitriona Balfe, Interviews, New York Comic Con, Richard Rankin, Sam Heughan, Sophie Skelton, Uncategorized and tagged Caitriona Balfe, Interviews, NYCC, Richard Rankin, Sam Heughan, Season Four, Sophie Skelton by Sarah Ksiazek. Bookmark the permalink.